After 2 plus weeks on the road in parts of the world where eating Tex Mex is plainly a bad idea (the Balkans, Asia, northern Europe) I needed a fix in the worst possible way. With 300+ options in front of me, I decided to visit taquera Rosie at the spanking new Taco Joint on UT’s campus. If Rosie’s not putting out the best flour tortillas in Austin right now, I’d love to know who is. Each lardy beauty has an impressive wing span and features those lovely little charred spots that exhibit a skilled hand on the comal. The weekend-only barbacoa is good at Taco Joint, a bit lean for my liking but when the tortillas are of this calibre I’m willing to overlook the lack of fat. Unfortunately the salsas (and there are a few of them) are pedestrian. I’ve sampled them all, and none is exciting or noteworthy. I very rarely eat Mexican food when I’m more than a few hours from the land of El Tri so I was filled with some intense cravings when I returned to Texas. Cravings that were met quite ably by skilled cocinera Rosie. 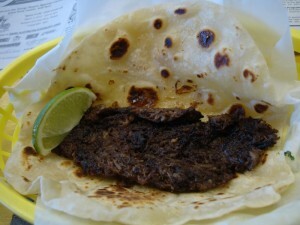 You may also purchase a la carte tortillas to go for the king’s ransom of .36c apiece! This entry was posted in Texas Daily Photo and tagged Austin, bacon, bacon egg cheese, barbacoa, breakfast tacos, cheese, corn tortilla, egg, flour tortilla, Mexican, scratch tortilla, taquera, Texas Daily Photo. Bookmark the permalink.